With a couple of adjustments, compared to our first test images and post on capturing high dynamic range panoramas with the Lumix FX50, the results are now more than acceptable. 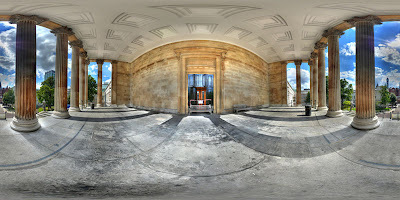 Pictured below in the main quadrangle of University College London captured using 108 images resulting in a 70 mega pixel panorama. The main building of University College London, pictured in this panorama, was designed by William Wilkins and constructed between 1827 and 1828. The building is centered on a Corinthian portico which is reminiscent of the British Museum, (constructed a couple of years earlier). View the Google Maps version of the panorama full screen (recommended) or in quicktime virtual reality (3.6Mb).